After a five-year break a brand new studioalbum by BASKERY ! The sisters of Baskery are back on European soil, after living and loving in the US for nearly 3 years. Their backpacks hold new songs, new experiences, new friendships and broken promises. It all started with a move to Nashville, a request from the band’s American publisher. The trio traveled overseas without a master plan and settled down in one of the less hip parts of the city. Surrounded by Mexican diners, body shops, a couple of tattoo studios, numerous stray cats and all kinds of opportunists, the sisters built a home in the American south, where they got creative in their living room and on the porch of their wooden house on Leafland Avenue. They biked through every limb of Nashville and got to know and appreciate the city, where so many people with artistic dreams come to fulfil them. A few low-cash-flow months later, the band basically lived on “chips y salsa” at the local Mexican, they received a call. The president of WBR Los Angeles had checked out the band on YouTube and wanted to meet with them. ASAP. The golden ticket to the city of dreams and angels became reality and the sisters boxed up their Nashville existence to jump on the carousel. The band signed with WBR in the fall of 2014 and moved to LA, a city with a completely different beat to it than Nashville and the sisters were up for the change. Nearly one year passed before the recording, alongside with producer Andrew Dawson (Kanye West, Rolling Stones, FUN), took place in Glenwood Studios, Burbank. The studio luxury they experienced there was quite the contrast to some of their earlier recordings and the band embraced a completely new way of working together with Dawson and his assistant Mike Malchicoff. One evening, the sisters sat in front of the fireplace in the courtyard singing an a cappella version of ‘Cactus Baby’, when Bruno Mars appeared and praised their harmonies. He told them that he was occupying ‘Studio A’ for a few months to work on his new album. Baskery’s recording in ‘Studio B’ was finished in just a few weeks, then off to be mixed by Joe Zook (Katy Perry, U2, The Hives). Fast-forward to the beginning of 2017. With a promising summer tour ahead of them, an album more than ready to take off and a band with growing misgivings, there’s the call from the manager. WBR is struck by an economic crisis and has to drop dozens of “developing acts”. Among them, the trio from Sweden. “The news” weren’t really news to the band, but the fact that the songs were facing the shelf for an indefinite time, left them uneasy. There were talks of hunger strikes outside the WBR headquarters and launching a pissed off give-us-our-album-back-campaign, but after some eager dispute with the help from a feisty and dedicated New York lawyer, nine of the twelve songs, the ones not yet launched by WBR, were returned to the band. Eight of these exempt songs are now released. 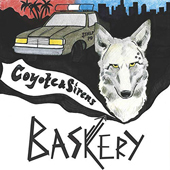 The band has chosen to call the album Coyote & Sirens, a dedication to life in Echo Park, the collision and interaction between urbanization and wildlife and the touching soundtrack of city wolves responding to the never resting Los Angeles emergency cries. The stray cats of Nashville lurk behind the opening track, ‘Shut the Catflap’, and all tracks on the album are inspired by the time, the life, in Nashville and LA. Kommentare deaktiviert für After a five-year break a brand new studioalbum by BASKERY ! Nach 5 Jahren Pause endlich ein neues Studioalbum von BASKERY ! Exclusively available in Europe at the Blue Rose webshop: Steve Sings Bob by STEVE WYNN !